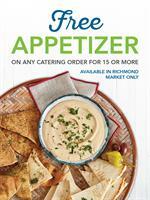 Taziki's Mediterranean Cafe is offering our fellow chamber members a FREE appetizer of their choice on any catering orders for 15 or more. We have got several delicous appetizer options including hummus, whipped feta, taziki dip, chicken salad, and pimento cheese dip. Please contact our marketing director at mafzalirad@tazikiscafe.com to redeem.